I’ve long been a fan of the ol’ mouth organ harp, probably since I first heard it in Elton John’s I Guess That’s Why They Call It the Blues. But through all my years, use of the ol’ juicebox has been left out to dry. Not since Blues Traveler’s Run-Around, their infinitely better song, Hook, and Alanis Morissette’s Hand in My Pocket has a song with a harmonica solo gone mainstream. John Popper and Alanis were topping the charts with those songs in 1994 and 95. That’s fifteen years without a prevalent Mississippi saxophone presence. Was it merely a mid-90’s thing? Am I missing any? (I’m sure I am.) Is the instrument dead to the pop music scene? 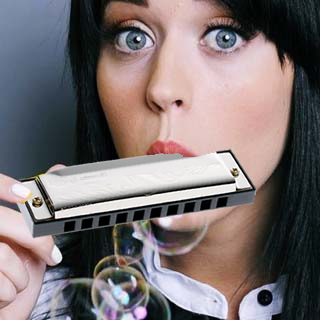 Can you imagine the likes of Katy Perry, Justin Beiber, or Ke$ha sliding a foreign metal instrument across their lips? To me, this seemed to be fit for a conversation about harmonicas. Draw your conclusions.